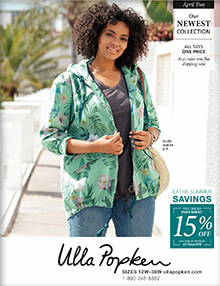 Amazing fashions for the stylish plus size woman are available in the Ulla Popken catalog which now includes our European line. Plus size tunics, tees, jeans, pants, dresses, leggings and more. New collection offerings each month. Enter code - 4015april19 - at checkout on the Ulla Popken website.